Remember to add your friend or loved one to PennDOT’s Emergency Contact Information. It only takes a minute to add the information online. If you are ever involved in a vehicle accident or other emergency, local and state authorities will be able to use the information you provide to contact a friend or loved one if you are unable to talk or are incapacitated. Information you can provide includes name, address, home phone, cell phone, and email address. To add or update contact information, visit Pennsylvania’s Department of Motor Vehicle page at http://www.dmv.state.pa.us/mobile_emergency_contact/mobileecilogin.jsp?navigation=true. . The information can be deleted or changed at anytime. 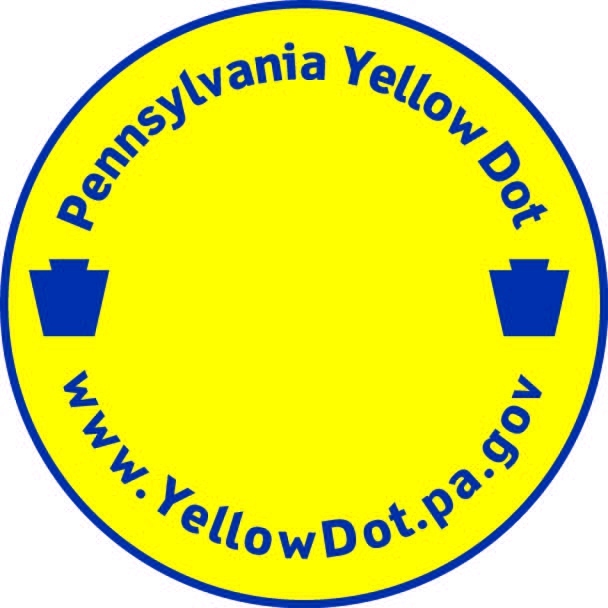 If you want to provide more details to authorities, another program, PennDOT’s Yellow Dot program, assists citizens in the “golden hour” of emergency care following a traffic accident when they may not be able to communicate their needs themselves. Placing a Yellow Dot decal in your vehicle’s rear window alerts first responders to check your glove compartment for vital information to ensure you receive the medical attention you need. The program is a cooperative effort between PennDOT, the Dept. of Health and Aging, the State Police, the Turnpike Commission, first responders and local law enforcement. Click HERE for more information about the Yellow Dot program.